This past week has seen your boy Tuesday get into a craze with finding shoegaze and dreampop covers of hit songs (Don't worry, this only happens every couple of months or so). I scoured my previous posts and asked for help digging up more from the amazing folks at the Shoegaze, Dreampop, and Nugaze facebook page, and then something interesting happened. Someone commented that on Friday their band would be releasing a cover of The Cure's "Burn," which is hands down one of my favorite songs from that seminal band. I reached out to them and asked if they would like to have me do an early release of their cover, and to my surprise they accepted! 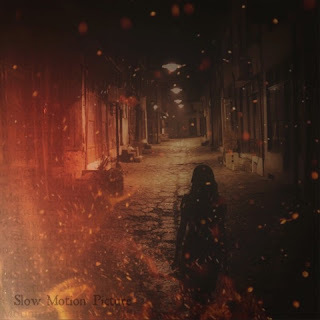 Slow Motion Picture is an orchestral alternative band out of New York. Their cover of The Cure's "Burn" has Brian Caesar working his multi-instrumental magic while featuring the feathery yet incandescent vocals of Elle Morissette. Their rendition puts the listener in the well-fit orchestra box, far from the dark moonlit vantages from where Robert Smith once ransomed them. Where The Cure could leave you feeling determinedly abandoned, Slow Motion Picture picks you up in an embrace of warm tones and transformative hues. It really speaks volumes to the composing skills of a band that's able to take a dirge meant for airing wants and loss, then being able to render it into a melodic arrangement that conveys a sense of hope amongst lyrics that speak of rejection. Slow Motion Picture - The Cure's "Burn"
Once again, big thanks to Brian Caesar for letting us get an early glimpse at a great cover of one of our favorite songs, be sure to check out Slow Motion Picture's Bandcamp to get a closer look at their other work and be sure to give them a like on Facebook. Let's go ahead and dive back into some reverb and dreaminess with some more covers. About half of these I need to give credit to the reverbnauts down at the Shoegaze, Dreampop, and Nugaze facebook page for digging them out of the rough for me to share. Enjoy! Day Wave & Hazel English - Interpol's "PDA"
Lazy Legs - Smashing Pumpkin's "1979"
BLUSH - Mariah Carey's "Fantasy"
The Daysleepers - The Smiths' "There Is A Light That Never Goes Out"
My Bloody Valentine - Wire's "Map Ref. 41N 93W"
The Raveonettes - The Stone Roses' "I Wanna Be Adored"
Lush - ABBA's "Hey Hey Helen"
Ciccone Youth - Madonna's "Into The Groove"
Meeks - The Beatles' "Across The Universe"
Venn - New Order's "Ceremony"
Alien Boy - The Smiths' "Hand In Glove"
Wall of Stars - Elliott Smith's "Twilight"
That seems like a good amount to close out with. With the sheer amount of covers there are out there, I think I will turn this into its own separate tab so I can just keep adding to it.